Candelilla/Jojoba/Rice Bran Polyglyceryl-3 Esters, Glyceryl Stearate, Cetearyl Alcohol and Sodium Stearoyl Lactylate. 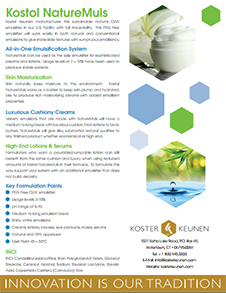 Kostol NatureMuls #577 by Koster Keunen is a naturally derived and PEG free, O/W emulsifier, wax & consistency factor and moisturizer. It is not tested on animals. Kostol NatureMuls #577 applications include creams, lotions, masks, eye creams, serums, foundations, mousse emulsions and skin care formulas. It complies with Kosher regulations. It has a minimum shelf life of 2 years.